A fully dressed and well-preserved corpse of a noblewoman who died in the 17th century has been discovered by French archeologists. The woman’s body was in a lead coffin, along with the heart of her husband. The body was found in the chapel of St Joseph’s convent in Rennes, Brittany, in northwest France, in March 2014. However, the identity of the lady was only revealed on Tuesday by the French National Institute for Preventative Archaeological Research(Inrap). The body, 1.45 meters in length, was still wearing shoes and a cap. It is thought to be Louise de Quengo, a widow of the Breton nobility who died in 1656 when she was about 60 years old. The identification was possible due to inscriptions on a lead reliquary about the heart of her husband, Pierrien Toussaint, who died in 1649. The heart was buried with the woman. Researchers say that Louise de Quengo was dressed in a religious style. “We saw right away that there was a lot of volume, fabric, shoes,” Rozenn Colleter, an archeologist from Inrap told AFP, adding that the scientists were able to distinguish "hands that were holding a crucifix." The lady was apparently wearing a linen shirt, woolen breeches, cork-soled shoes, several caps and a shroud over her face. They have been restored and they are expected to be put on display. “Louise might have adopted a monastic life after her widowhood,” Inrap said in a statement. 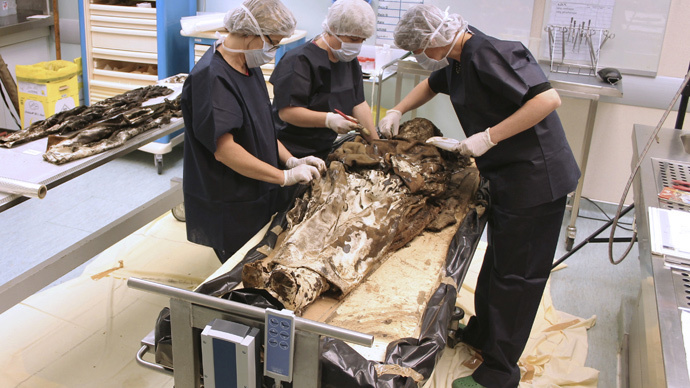 The archeologists were also able to determine the woman’s medical history. According to the statement from Inrap, the woman had "significant kidney stones" and "lung adhesions." The heart was taken out "with real surgical mastery," officials said. "With Louise, we had surprise after surprise," said Fabrice Dedouit, a radiologist and medical examiner in Toulouse. The corpse will be soon reburied in Rennes. The scientists also found four other coffins, as well as 800 graves that also date back to the 17th century. However, they contained only skeletons.